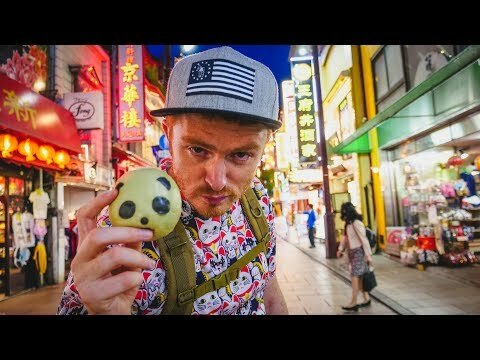 In this video we take you on a Yokohama street food tour through Japan’s largest Chinatown! Yokohama (横浜) is the second largest city in Japan by population and it’s a quick train ride from Tokyo, making it the perfect destination for a day trip. This is a port city that sits on the shores of Tokyo Bay, and while it has lots to offer in terms of attractions and sightseeing, we were drawn here by the food. The cool thing about eating in Yokohama Chinatown (横浜中華街) is that you get a unique blend of Chinese food and Japanese food, plus you can also choose between street food and restaurants. To get to Yokohama we took the Toyoko Line from Shibuya Station (渋谷駅). If you get on the express train you should get to Yokohama in 30 minutes, but we accidentally got on the slow train so it ended up taking over an hour – don’t make our mistake! Our one piece of advice for visiting this place is to come hungry! If you want to make the most of your very own Yokohama street food tour, you’ll need a big appetite because there is so much food to try. We barely scratched the surface. Alright good afternoon guys. It is time for another street food video. Today we’re going to be taking you guys to Yokohama (横浜). It is 30 minutes south from Shibuya station (渋谷駅). So yeah a bit of an excursion for food. Yeah, first time leaving Tokyo and we’ve brought our appetites. I didn’t really explain why we’re going to Yokohama but this is basically home to the largest Chinatown (横浜中華街) in all of Japan and also one of the largest Chinatown’s in all of Asia. So perfect place for street food. We’re going to have a mix of Japanese street food and Chinese street food. We have made it to Yokohama Chinatown (横浜中華街). It took us a while to get here. Yokohama street Chinatown (横浜中華街) is a great place for street food but if street food is not your thing you also have a whole bunch of Chinese restaurants to choose from and a lot of them are buffets so you pay a set fee and then you can eat as much as you want so definitely lots of food options here in Yokohama. This has been great so far. I mean we’ve only eaten at a couple of places and I’m already loving it. We have now turned down one of the little side streets here in Chinatown (横浜中華街) and what I find really interesting is that it is not just all street food and restaurants. Down the little side streets we’re also seeing like Chinese supermarkets. You have like massage parlors focusing on Chinese medicine and reflexology and you’ve got souvenir shops. I mean places to buy decorations for your home. And it is just so pretty to walk down these side streets as well because you have the red paper lanterns and the lights are starting to come on because it is late in the afternoon. I hope you enjoyed our little street food tour of Chinatown (横浜中華街) here in Yokohama (横浜). We had a really fun time just eating so much food. It was delicious. Yeah. I’m leaving here stuffed and I don’t feel like we spent that much money. No. That was cool. If you’re planning to travel to Japan and you’re going to be in Tokyo it is super easy to get to Yokohama (横浜). We’ll see you guys in the next video. Bye for now. This is part of our travel in Japan video series showcasing Japanese food, Japanese culture and Japanese attractions.